The National Theatre of Scotland and writer Rona Munro have relocated Lorca's Spanish set play to present day gangland Glasgow where gangsters moll Bernie rules over her five daughters as they mourn the gunned down of head of the family, Tony. But Tony's death has brought added pressures to the family including media attention and the necessity to cement an alliance with another underworld family. And of course the sibling rivalry that erupts as several of the sisters chase the one man. WARNING - the rest of this post will contain spoilers for the show. There's a lot of chatter about how well the update and relocation work, but to be blunt I have zero interest in that. Along with what I suspect was the vast majority of the audience I haven't seen any other version of the play, so all that matters to me is how well this version works. Are these characters and this situation believable - both as individuals and as a family unit? And sadly the answer is frequently "No". Munro's dialogue rarely creates a dynamic between the sisters that corresponds with their situation, and I never really felt that these characters had any long term bonds or history amongst them - certainly not the intensity one would expect from being cooped up against their will. Yes, there are some verbal barbs exchanged but they rarely hit home to any great effect. These characters should be much more capable of pressing each other's buttons. We also felt that the performances were a bit of a mixed bag. 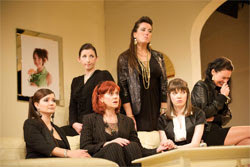 I liked Siobhan Redmond as Bernie and Louise Ludgate as Marty but Waldorf wasn't convinced by either, while Jo Freer and Carmen Pieraccini as Maggie and Melly were underused to the extent that they may as well not have been there. I initially hated the performance of Vanessa Johnson as youngest sister Adie but as the show progressed I grew to appreciate the echoes of Redmond's Bernie in Johnson's tones and movement. Oldest sister Agnes suffers badly from a combination of Munro's writing, John Tiffany's direction and Julie Wilson Nimmo's performance that renders her little more than a caricature. Similarly, Myra McFadyen as Bernie's friend Penny seems to exist largely to fill the audience in on the family background. Munro and Tiffany also bewilderingly bring about the situation whereby Bernie concludes a furious gunpoint argument with Adie by casually placing the gun on a sideboard inches from Adie and then walking away. A mistake there had been little to suggest Bernie would make. Despite all the negatives I found it a pleasant enough evening at the theatre - Waldorf on the other hand was left cold by it. To be entirely fair, sections of the audience at the Citz clearly enjoyed it significantly more than we did and gave the cast a strong reception at the curtain call. The House of Bernarda Alba continues at the Citizens until 3rd October and then visits Dundee Rep, the Alhambra in Dunfermline and the Kings in Edinburgh. Was hoping you'd make it to this! I'm with you, Statler, especially on the weak dynamic between the sisters and the uneven performances. Interestingly I've spoken to quite a few people who enjoyed the show well enough but nonetheless agreed with a lot of my criticisms of it.